book 5, page 7, which is part of the Dowd collection in the Provincetown History Preservation Project. The shellfish area near the west end breakwater is open for the season. obtained by visiting the town clerk's office, at Provincetown Town Hall. 65 and older can dig for free, but you must get your license and gauge. The abundant supply of clams in Provincetown Harbor is said to have saved the lives of Pilgrims and early settlers here, and the gathering of a rich variety of shellfish along our shoreline, there for the taking, has been a time-honored tradition of local people ever since. To harvest your own shellfish from Provincetown's tidal flats you'll need a shellfishing license, which allows you to gather shellfish on a recreational basis on Sundays or Fridays, in a currently designated area, through the end of March 2016, with a ten-quart limit per week. Areas open to shellfishing may vary during the season, as designated by the shellfish warden. This license does not allow you to sell your bounty, and shellfish you gather must be of legal size, so you must carry a gauge with you, along with your license. You won't be allowed on the flats without them. You'll also need a shellfish rake or similar tool, and either a ten-quart pail or a one-peck shellfish basket. No other containers are allowed. Tall rubber boots or waders and waterproof gloves will be helpful, and wearing warm, wind resistant clothing is a good idea. During open periods, shellfish may only be harvested on Sunday or Friday of each week. Permit holders may only shellfish on one of these days per week. Quahogs gathered must be one inch thick, soft-shelled clams must be two inches long, and oysters must be three inches long. 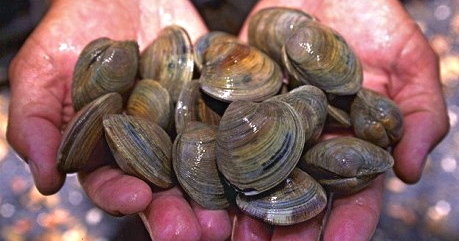 The weekly limit for recreational permit holders for any combination of quahogs, soft-shelled clams and oysters is either one level ten-quart pail, or a one-peck basket. If Bay Scallops are abundant, the Shellfish Warden will post the days and location for their taking, limited to two pecks per week. No permit is required for sea worms, periwinkles, or mussels, which may be taken year-round. Upon leaving the flats, you must report to the Shellfish Warden, who maintains a record of the town's yearly harvest. In any given year, residents might gather more than 1,000 pails of shellfish along Provincetown shores. Fresh littlenecks, scrubbed and ready to go into the pot. This weekend should be great for clamming, with sunny skies, little wind, mild temperatures, and daylight during low tides. Friday should bring about 46 degrees with the low tide just before noon. Sunday looks to be about 53 degrees with low tide at 1:47 PM. Winds of a mere 10 miles per hour are predicted for both days, so get your permit and go try your hand at digging shellfish. There's something especially satisfying about having a meal of seafood harvested through your own efforts. Whether it's a stuffed sea clam baked in the oven, a hearty chowder, or linguine with clam sauce, there's nothing like fresh, local seafood right out of the water, and digging your own clams seems to impart a bit of added flavor when you sit down to such a dinner. Friends can feel an extra dimension of camaraderie in foraging together for a meal they'll share as they warm up from their chilly adventure on the tidal flats. From a simple pot of steamers or mussels to an elegant platter of oysters Rockefeller, nothing tastes better than a meal that truly results from your own resourcefulness. Bon appétit!